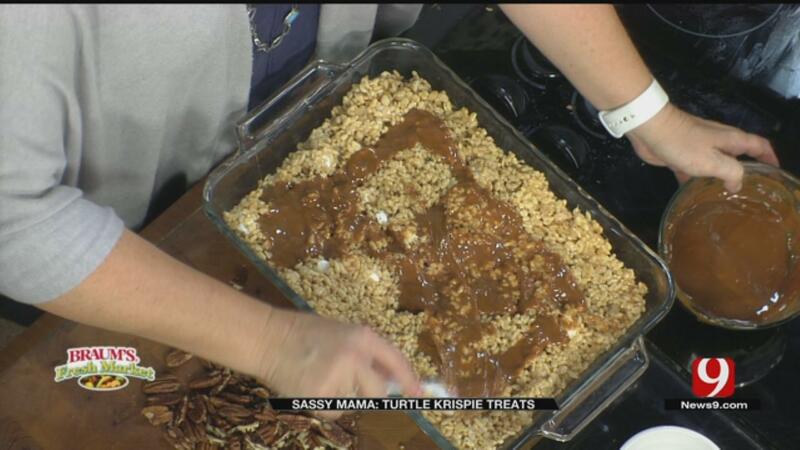 Continuing my series of yummy fall treats I really shouldn’t make or eat but they look too awesome not share, have some Turtle Krispie Treats, created by Sassy Mama, in conjunction with Braums and KWTV-Channel 9 in OKC. Tell me this doesn’t sound wonderful! •In a large saucepan, melt the butter and 6 cups of marshmallows stirring constantly. •Place in a greased 9×13 baking pan. •Pour 1/2 of the melted caramel over the top and spread to cover. •Repeat with 1/2 of the chocolate. •Drizzle the remaining caramel and chocolate over the top. If you want to know more about the Sassy Mama, you can check out her WEBSITE! This entry was posted in Writing Life and tagged family, food, fun stuff, links, recipe, Tuesday Treats. Bookmark the permalink.